Zahra Ashrafi is a truly inspirational and remarkable Iranian-American woman who lives in the Pennsylvania area with her husband and two sons and is a dentist by profession. Her passion is running and she has already run many marathons around the world. After hearing about she set herself the herculean challenge of running two 50K ultra-marathons back to back in the grueling climate and conditions of Antarctica and Chile’s Punta Arenas, in late January to Early February 2017, in order to raise funds for OMID. 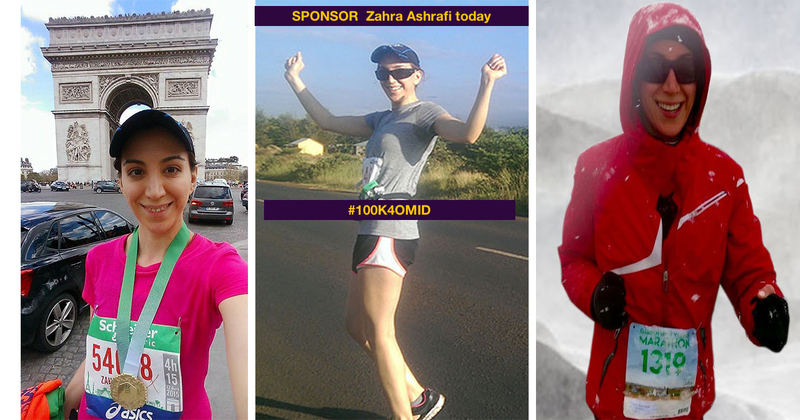 Zahra Ashrafi tells us about why she is running for 100K for OMID, her plans top run on all continents and why she feels an affinity with the girls in our center in Tehran. “During the whole 100K that I will be running, the thought of my own two sons and the girls of OMID will hold that place in my mind that keeps me going. My goal is to raise funds for the brave girls that OMID is supporting, whose stories of hardship and resilience I first heard of in the film “The Glass House.” These girls have been through circumstances in life that are unimaginable in a society that leaves little room for hope. OMID is the only place that truly gives these girls hope. By the age of 20, every girl in the religious community I was raised in, had married. Despite my parents conservative values and the clashes we were having regarding my choices, I remember my father turning to me after a 16 year old childhood friend’s wedding and saying “Whatever you do, you are not allowed to get married until you have a doctorate.” I have been lucky enough to have always had men in my life that were “feminist” without realizing it. I’ve often joked that my father treated me like the son he never had until my brother came along 15 years later. Yes, he was conservative and wanted me to be a good Muslim girl that prayed, fasted, wore hijab and listened to her parents. More importantly, he valued and placed emphasis on how strong I was, how intelligent I was, how hard I worked, how helpful I was–never once mentioning physical attributes, something I’m grateful for today. He only cared about my education and career aspirations. Growing up in the U.S, I was bullied relentlessly in school as the only hijab wearing Muslim girl, so I often buried myself in my schoolwork. My self-esteem suffered until the day I decided that I would not give anyone the power to make me feel worthless, and became determined to ignore what other people said about me. I was called an unruly girl, with more than one person suggested my mother find a husband that could “tame me.” I refused to allow anyone to judge me or set limits on what I could and could not do simply for being a girl. I set my own rules and through university and dental school, continued to work and study hard. Much like my mother, I married a fellow student, but not until the year I earned my doctorate as my father had demanded all those years ago. Funds raised from this amazing dual feat in potentially extreme conditions will go towards supporting OMID’s activities for the girls in Tehran. This will include OMID’s athletic programs and the OMID Mountaineering Club. Zahra is running to raise funds for OMID in two of the world’s toughest race locations in Antarctica and South America. Support her inspirational appeal and help us to achieve our fundraising target.